Weekend is here! (=no work related e-mails woohooo!) And the middle of November, it feels like yesterday when I titled my post ‘end of October’. This is what I wore yesterday, it was a cold grey Friday. Black & white & grey. A-symmetric sweater, leather jacket, chunky scarf and boots. Perfect boots, with that kind of small heel you can walk all day without pain. Now I’m taking really easy this weekend, just blogging and good food and some basic things. Meaning Christmas decoration shopping, starting to read a new book and learning to cook the perfect pasta al ragu. Taking easy is a good thing, because on Monday I’m leaving to Stockholm! Only for one night though, an exciting photo shoot coming up. Then next weekend pre-Christmas party, I’m already waiting for that big girls night out. It’s been too long since my last night out, but that’s what happens in autumn. Balance is the best. Tomorrow the forecast promised a sunny weather, the first thought was oh I need sunny outfit pictures! But now, have a nice Saturday night sweeties! Marraskuun puolivälissä jo mennään, vaikka vastahan mä otsikoin postauksen lokakuun loppumiseksi. Kai se on uskottava että pari viikkoa vierähti hetkessä. Toiset vielä niin päästään joulukuuhun, eli kyllähän tää tästä, kaikesta harmausmasistelusta huolimatta! Harmaudesta puheen ollen, aika värittömiä on viime aikoina asut olleet. Nämä kuvat ovat eiliseltä, päällä oli nahkatakki (hrr varmaankin vikaa kertaa), helmasta epäsymmetrinen villaneule, muhkuhuivi, lempifarkut ja bootsit. Juuri sopivan korkuiset bootsit, joilla jaksaa kävellä koko päivän ongelmitta. Nyt vietän viikonlopun vain rauhallisesti: hyvä kirja, kokkailua ja blogia. Tarkemmin täydellisen pasta al ragun opettelu, Outi Pakkasen Rakastaja ja seuraavien postausten suunnittelua. Ihan hyvä viettää rento viikonloppu nyt ennen maanantaita, silloin nimittäin koittaa lähtö Tukholmaan eräitä kuvauksia varten! Vähän jännittää, mutta enköhän joten kuten selviydy. Ehkä. Hyvä ottaa rennosti nyt myös siksi, että ensi viikonloppuna pääsee sitten kunnolla viettämään pikkujouluja tyttöjen kanssa, drinkkejä ja illallista ja mitähän keksitään. Odotan sitä niin jo nyt! Mummoudun aina tähän aikaan vuodesta, kun koti-illat vain houkuttelee enemmän, mutta nyt oon jo aika balanssissa ja ajattelen taas, että fiiliksen mukaan molempia. Mutta nyt, hauskaa lauantai-iltaa kaikille! Love leather biker jackets…have you seen my last one? Have a great Sunday Marianna! Love the outfit, all the pieces come together perfectly! Very cool jacket, as always so nicely styled. Have a brilliant weekend! I still find it so awesome that you designed some things for your own line! I hope you get more opportunities to design in the future, especially jewelry. What book are you starting? I love to read, and would love to hear more about the books you like. To me it is also very interesting! Suuri huivi yhdistettynä nahkatakkiin on jo lähes klassikko, mutta toimii aina yhtä hyvin! So perfect, you can’t go wrong with black and leather. Could wear it like you every day! Perfect jacket and bag! You look beautiful in this minimalistic outfit! Love these simple outfits that are so classic! A girl doesn’t need more then a biker jacket and a warm knit to look absolutely fabulous! Love this outfit Marianna, I’m living in knits and leather these days. I love your Grey Scarf! Love your outfit, awesome jacket!! So simple, but I’d wear this any day, love it! Really beautiful outfit, I love the leather jacket ! Looking lovely as always Marianna! i love this look. wonderful inspiration. I need to wear it like you. That’s a really great outfit, I love everything about it. I love this outfit so much! The jacket and scarf look beautiful together. Great look! Love the cozy knit with leather! I really don’t understand how you became a blogger and how you could possibly live from it. I mean, your outfit and your style are beautiful but most of all terribly BASIC…! Stunning pictures and outfit inspo ! You look amazing! I love your jacket! You look amazing! 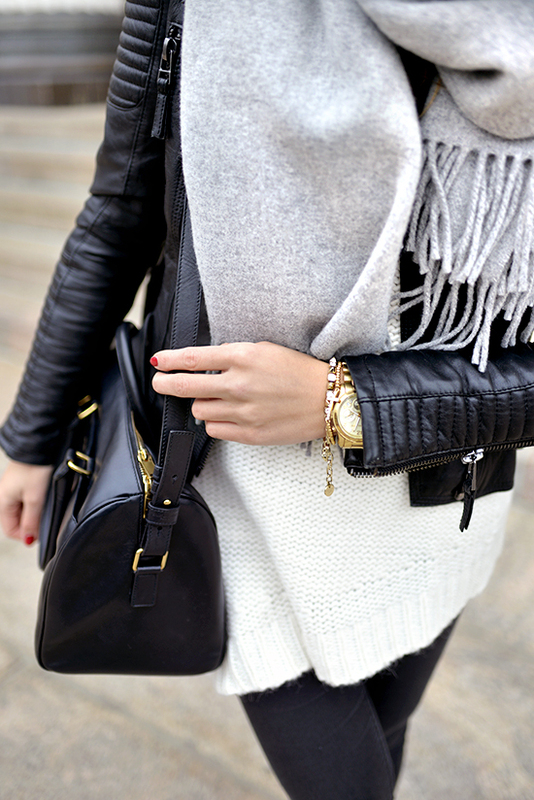 I love the combo of the biker jacket and the big scarf! Great look! Love this scarf so much, looks super chic! and I just wanted to say that I’ve been following your blog for maybe 3 years already and I still love it. It’s the perfect combination of everything I love. So sending you a virtual hug back and keep doing what you’re doing! I love your jacket and scarf!! Love your outfit! I would wear it the same way! And i like your curls! Can you do a tutorial? Wasn’t that too cold for a leather jacket? I already wear my winter jacket :D.
It was a little bit, I don’t think I can use it anymore. 😀 Thank you Kasia! Love that jacket every time you wear it! Scarf is an absolute perfection, so is the jacket! Great scarf. Warm and kuddly! Love love love this outfit!! Ihanan rock nahkatakin ansiosta, mutta kuitenkin mielettömän pehmeä tuon huivin takia 🙂 Ihan täysi napakymppi! I fell in love with your scarf since I saw it for the first time. I was looking for it at Becksöndergaard but I couldn’t find it. Is it an old scarf? No, it’s a new one! 🙂 I’ve seen it around here in a couple of different stores in many colors, have it in black also. I hope you’ll find it!